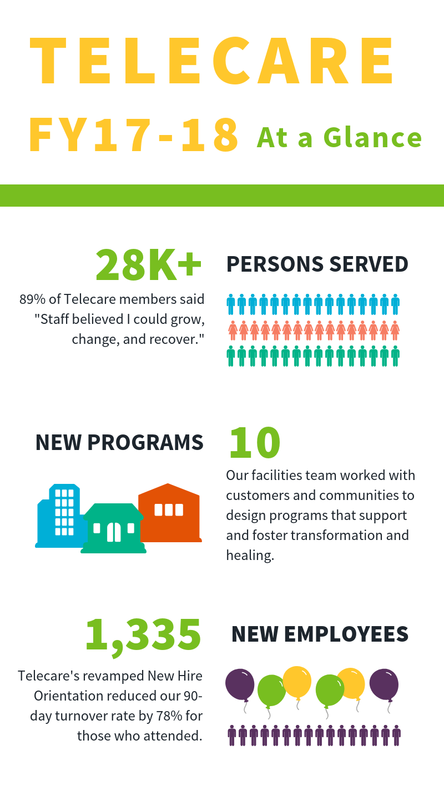 Each fall, Telecare takes time to reflect and document the progress we’ve made over the last fiscal year. In this issue, we share our recently completed FY17-18 annual report and yearly video. In these, you’ll find stories about our homeless efforts in Orange County, CA, our healing environments in King County, WA, and how our organization is building capacity for the future. And in case you missed it, Telecare’s substance use experts recently presented at the Substance Use Disorder Statewide Conference put on by the California Department of Health Care Services. We’ve included a copy of their presentation — on reaching the “unreachable” — in this issue as well. Despite the challenges we face across our country, there is a groundswell of hope and promise when it comes to serving people with urgent issues and complex needs. Telecare’s customers have been working to expand and improve their systems of care, to not only increase access and reach more people, but to deliver services in more effective and meaningful ways. In FY17-18, Telecare was honored to help partner in these efforts. We also made great progress in building capacity for the future — in everything from workforce and psychiatry, to our facilities, technology, and more. Please explore our FY17-18 annual report and yearly video to learn more. In August 2018, Telecare presented at the Substance Use Disorder Statewide Conference put on by the California Department of Health Care Services. Our presentation, "Reaching the Unreachable: Engaging People with Substance Use Disorder in Pre-Contemplation Phase" is available for download on our website. Click here to read more. Telecare's Multnomah CATC program in Portland, OR, was pleased to host a pancake breakfast event that welcomed Oregon legislators, customers, staff, peers, and other program administrators to build connections and strengthen our relationships with stakeholders. Thank you to our customers and friends who took time out of their busy schedule to come to visit us. Click here to see more photos from the event.